Moose facts are plentiful and many articles have been written about deer, unfortunately this is not the case about moose. The number of publications about other members of the deer family far outweigh those of moose. 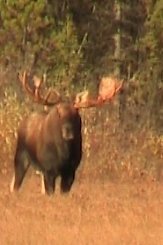 We hope to provide some of the facts about moose on this website. Moose are easily recognized by their palmate antlers, while other members of the deer family have twig like antlers. Moose predominantly live in the mixed deciduous and boreal forested areas of the Northern Hemisphere preferring the sub arctic and temperate zones. Moose do not fair well in areas where the mean temperature is above 65 Fahrenheit (18.3 Celsius) as they go into heat stress at this point. Alces Alces is the scientific name for Moose... in Britain they are known as Eurasian Elk and in North America as Moose. Elk in North America refers to an entirely different animal sometimes referred to as Wapiti. Plural form of the word moose? The word goose has a plural which is geese, moose on the other hand has no plural. Any reference to meese or mooses is incorrect. In North America, the moose range includes almost all of Canada, most of Alaska, much of New England and upstate New York, the upper Rocky Mountains, North-eastern Minnesota, and Michigan's Upper Peninsula and Isle Royale in Lake Superior. Isolated moose populations have been verified as far south as the mountains of Utah and Colorado. Isle Royal has been a study location for moose and and the predation from wolves for many years. Scientists have been using the data gathered there for the management of moose and wolf populations in other areas of the country. In Europe, moose are found in large numbers throughout Norway, Sweden, Finland and the Baltic States. They are also widespread through Russia. Small populations remain in Poland (Biebrza Nat. Park), Belarus and the Czech Republic. A rare sighting globally is the albino moose. Seen infrequently in the northern hemisphere, a sighting by you would be as rare as the animal itself. There are however; small populations in several locations in Canada, Sweden and USA. In 2008 a pair of breeding Moose were re-introduced into the Scottish Highlands, there have not been any Moose in Scotland in over 1700 years. In 2009 Moose were released as well as the spring of 2010. It will be interesting to monitor the herd’s growth and adaptation to the region. There are four sub-species of moose that have been accepted by scientists and biologists as the current classification. Of course, as science and knowledge grows this is always subject to change. It is widely accepted that moose of North America all came from Siberia somewhere during the last glacial period (Wisconsin) around 10,000 to 14,000 years ago. 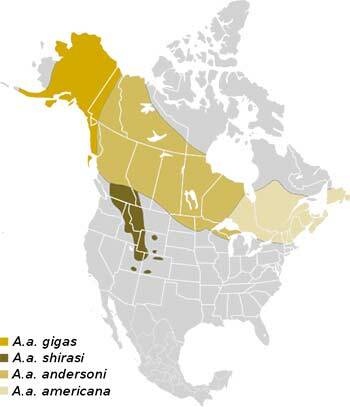 It has been hypothesized (Peterson 1955) the northern or tundra moose were separated from their three southern counterparts by vast grasslands. Regardless the moose of the tundra are much larger and do behave somewhat differently than their southern counterparts. In English, the Latin name Alces means "elk". In Europe the word elk and moose are synonymous, moose are also referred to as "alg". Only the male, called a bull moose grow antlers. Moose antlers start their growth in the spring of the year, during the period of growth which lasts until the autumn the antlers are covered in what is commonly known as felt. This felt brings a rich supply of blood to the antler which aids in their growth. If the felt is injured during this period the Moose antler may suffer a blood supply loss and grow abnormally. When fall arrives the antlers cease to grow and the felt starts to deteriorate and fall off. At this stage the Moose will start to rub his antlers on bushes and trees to rid himself of the felt. A wildlife biologist, Dr. Vince Critchton has documented Moose eating this felt. It is unknown why the Moose behave in this way. Mature bulls shed their antlers early in the winter and immature bull have been known to carry their antlers into March of the following year. The antlers grow at right angle to the moose head, the growth is cylindrical at the base while the rest of the antler splits into several tines or points. As a moose ages, the larger the set of antlers is that he grows. This larger set of antlers will be palmate with tines. The average life span of a Moose is 15-25 years. A mature Bull Moose can weigh as much as 380–720 kg (850–1580 pounds) and Cow Moose weigh 270–360 kg (600–800 pounds). The largest of all Moose is the Alaskan Moose which can stand over 7 feet high at the shoulder, has a antler span of 6 feet and mature Alaskan Bull Moose has an average weight of 630 kg (1,386 pounds) and Cow Moose weigh 478 kg (1,052 pounds). In September 1987 the largest confirmed kill of an Alaskan Moose was 820 kg (1,800 lb) and was 233cm (7 ft 8 in) at the shoulder. Bison is the only land animal of North America and Europe that is larger than a Moose. Moose are mostly daytime active and sleep during the night, although moose have been observed feed in meadows on well moonlit nights. They are typically solitary animals and the strongest bond is between the cow and her calf. I have seen bulls grouped together in bachelor herds. Calves are aggressively chased away from their mothers when they are just one year old just in time for her to give birth to a new calf. The mating season called the Rut happens in late September and goes through October. The bulls look for several cows to breed with and will compete with other males to show superiority. These fights are usually nothing more than posturing; show each other their antlers and body size, trying to intimidate the opponent. During the rut, bull moose create wallows to attract females to breed. These are simply a mud pit or depression in which the bulls urinate and lay in. The fights will sometimes involve the antlers in which the pair will push and twist the other to show their strength. Some of these fights will lead to severe injury or even death can result. During this time the animals call to each other, they are easily mimicked using moose calls of a variety of types. Wolves typically hunt moose as a pack although individual wolves have been known to hunt adult and kill adults. Black Bears fresh from their den in the spring will prey on newborn calves and the elderly moose for the first part of the year. Later as food becomes more plentiful the black bears will only pursue moose as an opportunistic meal. Brown Bears also known as Grizzly Bears will prey on moose throughout the year and will certainly take over a wolf kill if they chance upon one. Bears are opportunists, on many occasions Hunters have returned to retrieve a killed moose only to find that a bear has laid claim to it. This is a dangerous time for the hunter; Brown Bears will defend their new-found meal vigorously. People who live in wilderness and rural communities, those who depend on moose for food and hunters are the ones who are the most passionate about moose. In Alaska there was once a time when professional hunters would supply moose meat to mining camps. Those days are gone now but moose meat still plays an important role in the meat supply for the people of the northern hemisphere. In Alaska alone the annual moose harvest is upwards of 8,000 moose which translates into a whopping 3.5 million pounds of meat. Moose Fact: Moose are hunted in almost every country they are found in; the meat prized by many is very similar to beef in taste and texture with a young moose being described as veal like. British Columbia a province of Canada is twice the size of Sweden and has a total moose population of about 170,000 animals. In Sweden the annual harvest of Moose is close to 150,000 animals this is twice the entire harvest of North America. In Sweden, no fall menu is without a mouth watering moose dish. Our house is no exception, we cook moose on a regular basis and have shared some of our favourite moose recipes with you. Generally moose would not be considered as aggressive towards humans, but like any Wild Animal we must respect their space, and if we were to encroach to close, well..... Watch out! During the mating season is when moose are the most aggressive amongst themselves and would pose the highest risk to Humans at this time. This moose fact should not be ignored! When harassed or startled by people or in the presence of a dog, moose may charge. I remember a time when I was out collecting firewood during the fall deer hunting season. My dog, a Labrador Retriever smelled something on the ground and started to make some loud sniffing noises. Suddenly there was bull moose charging from the forest, which, thankfully caused my dog to bark and the moose ran off. Fun Question: Find out the answer here... Do Moose Drool? Moose and vehicles do not make a good mix. In Sweden they fence the highways to prevent the animals from getting hit by automobiles. In northern and south-eastern British Columbia the forests are cut well back from the edges of the highways to provide visibility to motorists. On some stretches of highways is British Columbia the highways are also fenced similarly to Sweden. Because Moose have long spindly legs a collision with a vehicle will result in the body portion of the moose landing on the vehicle and because these collisions are at high speed the Moose will smash the vehicle, doing considerable damage. No-one wins in these situations, for even if the Moose survives he likely has broken legs and would have to be destroyed. You can learn more about moose antlers and what they tell you. Moose habitat is under siege in British Columbia by the Mountain Pine Beetle, click here to read about moose habitat destruction and the effects of it. Moose populations in many areas across North America are in decline. In the east a worm, identified as P tenuis has been shown to kill moose. The infection to moose, known as moose brain worm can have a large effect on population. Is this worm killing our moose? A more recent decline in moose populations has been blamed upon the winter tick. These blood sucking parasites are making life miserable for moose... to the point of death in some cases. Read more about the winter tick here. Moose Fibromas Tumors make the animals very ugly to look at, however they do not harm the animals and their meat is still good to eat. Do you believe in spiritualism? Do you believe there may be some sort of connection between man and animal? This article explores the First Nations belief of moose and spiritualism, even in modern times and how it could apply to white folks too!